Modern, Family-friendly, 4 bedroom villa, WiFi, UK TV, heating and Air Con. Casa Quinta is a modern, stylish four bedroom villa set in the grounds of the Residential Moraira Sport complex. The lounge has comfortable seating, a log burning stove, TV with UK and Spanish channels, DVD player, PlayStation 2, a music system, and books and games. The villa has heating and air conditioning throughout and, in addition, there is a wood burning stove in the sitting room. The dining area has seating for eight people and looks out through patio doors onto your own terrace and private gated garden with its bouganvilleas, pomegranate tree and fragrant jasmine. The modern kitchen is well-equipped with everything you need - dishwasher, fridge freezer, microwave, kettle, toaster, a n'espresso coffee maker and a filter coffe maker. Just outside the kitchen there is a utility area, with sink, washing machine and drying facilities. We will provide you with dishwasher tablets, washing powder and washing up liquid. There will also be basic refreshments for you when you arrive, tea, coffee, milk and water. There is a downstairs toilet off the hall area, and a marble staircase leading up to four bedrooms and two bath/shower rooms, one of which is ensuite. Two luxurious bedrooms, each with king-size beds, overlook the landscaped gardens and have wonderful mountain views, which can be enjoyed on the terrace that leads from each of these rooms. Two further bedrooms are very well appointed, furnished to a high standard with good quality twin beds. The villa's beautiful private enclosed garden has seating for eight for those al fresco meals cooked on your own barbecue or electric barbecue griddle. There are also sun-loungers for comfortable relaxation in the garden. The Residential Moraira Sport complex has a padel tennis court, and a woodland exercise and play area, and two swimming pools. One of these pools is heated for the Easter holidays. We, the owners of Casa Quinta, have between us ten children, ranging in ages from teenagers to pre-schoolers. We have an extensive understanding of what it takes to have a safe, relaxing, fun, family holiday. We know that you can't relax with an unguarded pool just a few feet away so we chose a villa with a safe, secure enclosed garden where the children can play while you relax on the loungers. When you are ready to swim there are two lovely pools set in beautiful landscaped gardens. We can provide on request all the things you need for a care-free holiday with young children - cots, high chairs, a pushchair, stair gates, children's crockery and cutlery. There is also, at the villa, everything needed for fun on the beach, umbrellas, bats and balls, buckets and spades etc. We also provide Padel and tennis racquets and balls. The rules for Padel are in the villa information booklet. Mark Kidd, his brother Steven and his sister Katherine have owned Casa Quinta in the beautiful town of Moraira for almost ten years. Mark, Steven and Katherine all live in the UK with their families, and they visit Moraira frequently to visit their parents, who have lived in Moraira For many years. Mark studied languages at University and can speak French, Spanish and German. He, therefore, deals with enquiries. Mark and his French wife, Vanessa have five children all of whom love Moraira and the three eldest girls spend most of their summer with their grandparents. Steven is an accountant and he deals with deposits and payments etc. He has two small girls aged 6 and 8. Katherine deals with the paperwork and will be sending out all the necessary information. She has three young children who keep her pretty busy. Also on the team are our excellent cleaners and Ximo (pronounced 'Cheemo'). who will meet you at Casa Quinta, show you around the villa and help you any way he can. We are registered with the authorities in Alicante and if you have any queries we are well known in the tourist information office in Moraira. Casa Quinta is one of 22 properties on a delightfully landscaped, gated urbanisation that has something for every member of the family. 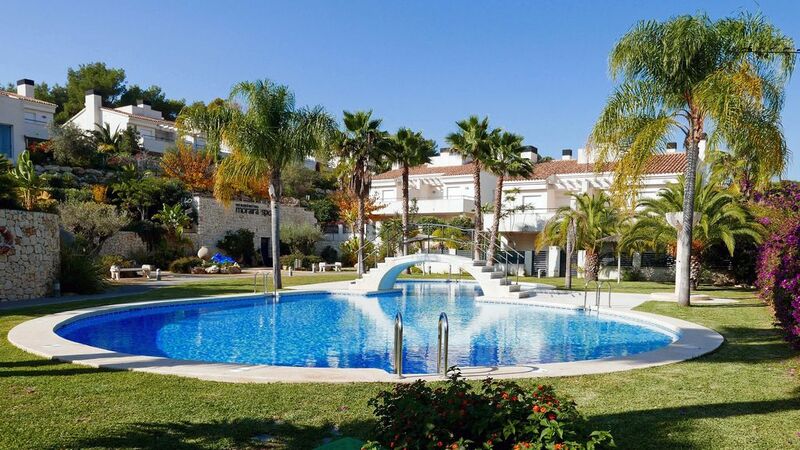 Strolling around the extensive gardens, working out on the fitness circuit or enjoying the two swimming pools, one suitable for lengths, the other perfect for children with one side quite shallow and on the other side of the bridge a deeper pool. You can play Padel, a great game, like tennis but using the walls like squash. Padel racquets and balls are provided in the villa for your enjoyment. It is a great place for all members of the family. For us, when we first saw the property we fell in love with the gardens, the space and the calm. The gardens are beautifully maintained by Ximo and burst with Mediterranean and tropical flowers, plants and trees. The sporting opportunities on site are a real bonus with a fitness course shaded in the trees perfect for the hot summer months. Casa Quinta has a filter coffee maker and an expresso machine. We enjoyed our stay at the villa immensely . It was clean, well equipped, plenty of room for 4 adults and two young children. The heating and log burner were great for the cooler February evenings. The Buggies and beach toys were much appreciated. The welcome pack was very helpful, water, coffee,tea milk etc.which averted a late night search for an open supermarket.Overall a great stay. The villa is very clean, well maintained and located up a secure gated drive. There is everything you need in order to have an enjoyable stay. The owners are also wonderful and made sure that we had settled in well and couldn’t do enough to make sure we were happy. There is a well stocked shop, two pubs and hairdressers within 5 minutes walk and Moraira is approx 20 minute walk. I have no hesitation in highly recommending this villa. Went to Moraira for second year in a row. Perfect place for us. This house was very lovely and with lots of space. We had some communication with the owners - and they helped us.. The area is quiet and only two km to the city center. Go for trips to Valencia and Altea. A fabulous villa on a beautifully maintained modern complex. The villa is well equipped and very comfortable (the beds are comfy too), we were 2 families (4a - 3c) and the villa has plenty of space to accommodate us all. The urbanization is very quiet with only a few round the pool, even in August. The pool is great for kids as has a large shallow end for non swimmers and it was immaculately clean. Its located really close to town but probably too far to walk for little ones, we drove down and taxi'd on an evening which is approx 8/9euros each way. The owners family met us on arrival and showed us in and we had excellent communication with Mark during booking and prior to arrival. I would recommend this villa with out question and would love to stay there again on our next visit to Moraira. I used to live in Moraira so am familiar with alot of the other urbanisations there and I would say this is one of the best. A fantastic complex with a wonderful pool that we all enjoyed - often having it all to ourselves!! We thoroughly enjoyed our stay in this villa which was fully equipped with everything we could need to make our family holiday as relaxing as possible. The town of Moraira & it's beaches had so much to offer us as a family and we enjoyed strolling along the beach, exploring the quaint side streets & choosing to dine each evening in a different restaurant - overall a fantastic holiday, in a great location and we will definitely be returning soon!! Casa Quinta is In the picturesque village of Moraira and just a short and shady walk (300m) brings you to the small shopping centre of Tabaira. Here you will find everything you need, a supermarket, a bar and restaurants, shops - and no need to get into the car! In Moraira itself, about two miles away, there are innumerable restaurants of every type from traditional Spanish restaurants to Italian, French, Chinese, Indian and Thai restaurants and from Michelin starred restaurants to small local eateries. There are restaurants specialising in fish and shell fish which have been caught daily by the local fishermen and there are tapas restaurants with wonderful arrays of tasty dishes. There are plenty of bars where you can sit outside and enjoy a local beer, a glass of wine or a jug of sangria. If you want to venture a little further Moraira lies between Alicante and Valencia, both interesting and historical cities to visit, and closer to home is Benidorm, busy in high season, but delightful in winter, and worth a visit for its fabulous selection of theme parks - Terra Mitica for some exciting rides and rides suitable for the smaller children in the family. Terra Natura for the animals, or Aqualandia to cool off in the water. There are lots of other places to visit if you can tear yourself away from the pool at your villa; the pretty town of Altea with its old town dominated by a beautiful blue-domed church; the safe, sandy beaches of lively Javea or Calpe, or go inland for breathtaking mountain views, traditional villages and orchards of almonds, cherries, olives and oranges. Other Activities: Go-karting, horse-riding, swimming and snorkelling, windsurfing, stand-up paddling and kayaking. Jet skiing and paragliding. Cycling and mountain walking, tennis and hiking. You will find more details of these activities in your villa.